I've used Royal Purple since my first oil change after purchasing the truck w/ 30k on the clock. Now it has 90k. It's good stuff....but sorta hard to judge how dirty the oil actually is because it's already a darker shade and it being purple. Probably not enough to make a pinch of difference. 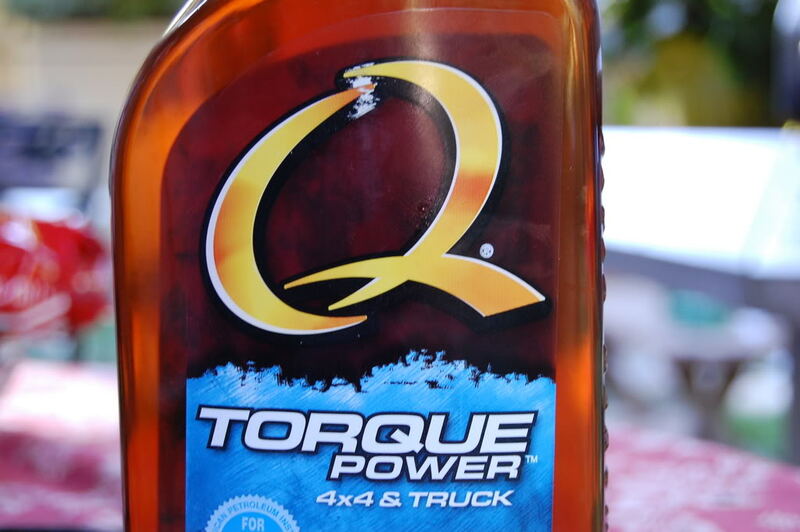 i just switched to synthetic Q torque power 4x4 and truck oil and i like it. I mean its not gonna make any difference at all really. I just switched from reg. to synthetic but i hear royal purple is good stuff. they have great transmission additives and the transmission oil is supposed to be similar. I have been running their diff fluid for a long time and the trans additive. now i will be switching to their engine and trans oil when i drop the trans pan in the next month. Its on par with Mobil 1 for protection. M1 even edges it out in a few tests. The Mobil is just cheaper and easier to find. You really should read some oil tests to see what you need. Or you can do your own research buy getting oil analysis done every oil change. It will add about 15 bucks to the cost of your oil change. Blackstone labs in Indiana is who I use from time to time. You know.. even if a superior oil can "function" and meet "specs" at higher milages. I still just can't mentally overcome the facts that polutants only increase with run time. Water, fuel, carbon, ect..
And a filter is only going to filter so much. If it gets plugged you get no filtration at all. IMO it's not wise to go more than 10k miles on any oil. And personally I'd not go more than 5k on a filter. Treating my engines like this with mobil 1, rebuilding them myself, and when I tear them down I have ultra little carbon build up. And the bearings look good. Most times the engine could have gone another 100k easily. How many miles do you have on your engines when you have to rebuild them Rich? How long do they run after piston slap develops, and you switch to 30W oil? What brand of 30W do you use? Last edited by Takeda; 09-09-2008 at 08:07 AM. For daily drivers I usually buy used cars with at least 50k on them. Who knows how they were taken care of. Usually in the 180k-200k area something valvetrain will give out. On my hot rod motors I've never had a failure. I usually take them down in order to upgrade and balance. Bob if you listen very carefully you can hear piston slap on nearly every engine w/o moly on the skirts. As far as 30W I switch when I'm sitting in the car, it's reached full temp, and I can still hear it. Usually up around 175K miles.. and me not owning it since new. I run Synthetic and change it out at like 6k. I always run the K&N oil filters too to last that long imo. My friend ran Royal Purple in his 06 GTO ever since the first oil change and changed it every 7500 miles. The car has 40,000 miles. He just recently switched to Amsoil and he plans on changing it every 7500. No problems at all with the engine. It is modded DD and sees the track every now and then. Oh and it had a K&N FIPK a month after he bought it. He would have to clean the throttle body about once a year so he installed an oil catch can and now the throttle body stays clean enough to eat off of and even with the FIPK still installed. Last edited by whippersnapper02; 09-09-2008 at 03:27 PM. GM & Scamsoil, meant for each other!!! Did the RP change in wife's Scion, flet like a HP increase for couple hundred miles....then got used to diff?? But did Mobil1 change last time and seems just the same. IMO, RP isnt worth the price....just hadda try for myself. Royal Purple is a fine race oil, but many UOA's have shown it to quickly shear to a lower weight. I'd use something else. I have run Amsoil for years with great success, I personally never have used royal purple, but I hear as stated above that it tends to shear.